I have been invited to take part in an exciting new project exploring the spiritual history of Ireland and visiting the historic sites associated with Ireland’s spiritual past. David Patton, who describes himself as a ‘passionate explorer of life, culture and Faith,’ has turned to crowd-funding as he plans a full-length video documentary that takes viewers around Ireland, visiting the sites that connect people in Ireland to a shared spiritual past. David has been developing the concepts for this new documentary since 2002, when he first started investigating Ireland’s rich spiritual heritage. Since then, he has had a dream of researching the pivotal stories in the Irish spiritual journey and looking at their impact on our present and future. David describes himself as ‘a local church leader, passionate communicator and student of faith.’ As he begins to put together this new documentary, his team is planning a filming project that takes him to heritage sites across Ireland. Already, he has commitments from people who have agreed to contribute to the documentary and to be interviewed for the project. They include Nick Park, executive director of the Evangelical Alliance Ireland and Dr John Scally, Professor of Ecclesiastical History in Trinity College Dublin, as well as me as a priest, writer and theologian. He is now crowd-funding as he searches for financial support to make this documentary, with a target of raising €18,000. He says over 50% of the funds will be spent directly on the filming, production and post production. In addition, 30% of the budget will be spend on research, content creation and the writing of the script that will form the basis of the documentary. The remaining 20% will be used to make physical copies of the documentary as well as PR and advertising to get the film into as many hands as possible. Once funded, the team plans to film the documentary in the spring and summer months next year, and to have the documentary finished by November 2018, giving backers a chance to receive their DVDs in time for Christmas. ‘We think the finished product will make a great Christmas gift for friends and family,’ he says. For €8, funders are promised a personal thank you as well as a download link to watch and save the documentary on any device. For €12, they will receive a DVD of the documentary once it is released. For €50, funders will be sent five copies of the DVD in time for Christmas 2018 to share with friends and family. For €200, a donor and a guest will be invited for a first screening event ahead of the release, followed by an after-party, as well as a DVD copy of the documentary. For €500, donors will have their name or company name featured in the credits of the documentary as a special thank you. For €700, the name or company name of subscribers will be featured in the credits of the documentary as a special thank, and receive two tickets to the first screening and after-party. For €2,500, there is an opportunity to join the team on set during the filming of the documentary, along with all the other offers. More details about how to join funding the project are available through this link. It is always a personal pleasure, and an academic affirmation, to find yourself referenced in books by colleagues you respect. Recently I wrote about the pleasure of unexpectedly finding a reference to my own work in the scholarly, landmark edition of The Poems of TS Eliot poems edited by Christopher Ricks and Jim McCue, and published by Faber & Faber in two volumes in 2015. These two volumes are defining contributions to our understanding of the work of TS Eliot, and I am referred to in their commentary on Eliot’s poem A Song for Simeon. 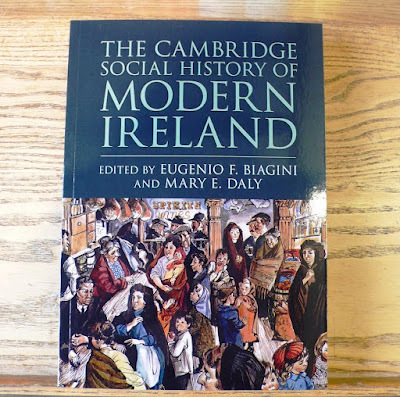 Earlier this month, during a fleeting visit to Cambridge, including the bookshops and Sidney Sussex College, I came across The Cambridge Social History of Modern Ireland, edited by Eugenio F Biagini and Mary E Daly, and published a few months ago by Cambridge University Press on 27 April 2017. Eugenio F Biagini is Professor of Modern and Contemporary History at the University of Cambridge and a Fellow of Sidney Sussex College, Cambridge, where, since 2008, I have been a regularly participant in the summer schools and conferences organised by the Institute for Orthodox Christian Studies. Over the years, he has been a regular visitor to the Church of Ireland Theological Institute, where we have shared many meals and conversations together. Mary E Daly is Professor Emerita of Modern History at University College Dublin and President of the Royal Irish Academy. In this new textbook, the contributors they have brought together cover three centuries of unprecedented demographic and economic changes, providing an authoritative and comprehensive view of how Irish society was shaped, at home and abroad, from the famine of 1740 to the present day. 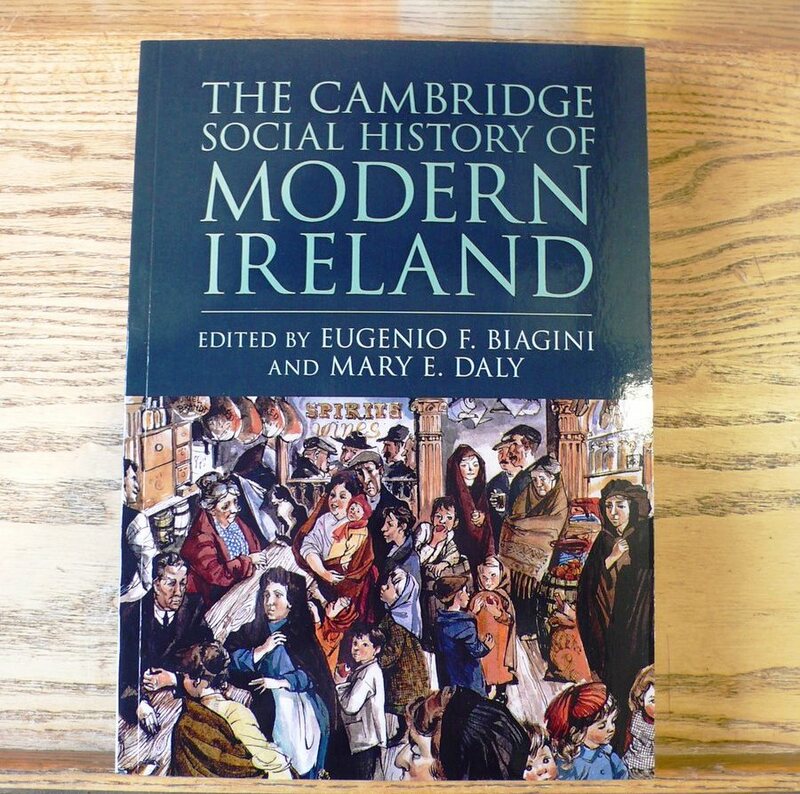 This is the first major work on the history of modern Ireland to adopt a social history perspective, and it focuses on the experiences and agency of Irish men, women and children, Catholics and Protestants, and in the North, South and the diaspora. In his chapter on ‘Minorities,’ Professor Biagini refers (p 455) to a feature I contributed to The Irish Times on 30 October 2000, and how I placed the Jehovah’s Witnesses ‘On Christianity’s margins’, on a spectrum that ranged from the (strictly Trinitarian and Evangelical) Plymouth Brethren, to the Mormons and Christian Scientists. Earlier this year, Palgrave Macmillan and Springer published Representing Irish Religious Histories: Historiography, Ideology and Practice. This book, edited by Jacqueline Hill and Mary Ann Lyons, was published on 10 February 2017. Jacqueline Hill is Professor Emerita at NUI Maynooth, with an interest in 18th and 19th century Irish history, especially religious and political history. She supervised my research in Maynooth in the 1990s on Irish Anglican missionaries in southern Africa. Her publications include From Patriots to Unionists: Dublin Civic Politics and Irish Protestant Patriotism, 1660-1840 (1997), and she has edited a volume in A New History of Ireland (2003/2010). Mary Ann Lyons is Professor of History at NUI Maynooth, a former joint Editor of Irish Historical Studies and President and Conference Secretary of the Catholic Historical Society of Ireland. Her publications include France and Ireland, 1500–1610: politics, migration and trade (2003/2015) and Church and Society in County Kildare, c.1470–1547 (2000). This collection begins on the premise that, until recently, religion has been particularly influential in Ireland in forming a sense of identity, and in creating certain versions of reality. Professor Biagini has also contributed to this collection, with a chapter on ‘Patrick, the First Churchman’ in the Protestant Vision of Ernest Bateman of Booterstown (1886-1979)’ (pp 211-227). Ian d’Alton, who contributes the previous chapter, ‘Religion as Identity: the Church of Ireland’s 1932 Patrician Celebrations’ (pp 197-210), also has connections with Sidney Sussex College: he has held visiting research fellowships at University of Liverpool and Trinity College Dublin as well as Sidney Sussex College. The third reference I have come across in new book in recent days is in a book that is quite different in its approach. Hugh Oram is a prolific author, and his Charmers and Chancers was published late last year [16 September 2016] by Trafford Publishing, independent publishers based in Bloomington, Indiana. Hugh Oram is an author, journalist and broadcaster living and working in Dublin. He has written many travel, historical and documentary books over the years, including The newspaper book, A history of newspapers in Ireland, 1649-1983. In Charmers and Chancers, he tells the about many famous and infamous people he has met and often interviewed during his 50-year media career. His latest book also includes a lot of personal and family history. I am not sure whether Hugh Oram regards me as famous or infamous, as a charmer or a chancer. But when I came across his reference to me, I was charmed, to say the least.